Please note that although we can still take course bookings for non-resident or camping participants, all accommodation in the Manor and Mews is now full. Simon Mayor is beyond doubt this country’s finest mandolin player, moving effortlessly between classical, traditional folk, jazz & blues. His dazzling technical skills grace all the music he plays. He’s also a fine guitarist & fiddle player, with a delicious sense of humour & great teaching ability. The overwhelming success of Simon’s ‘Halsway Manor Mandolin Workshop Weekend’ over the last two years prompted immediate requests for this return visit – and here it is! 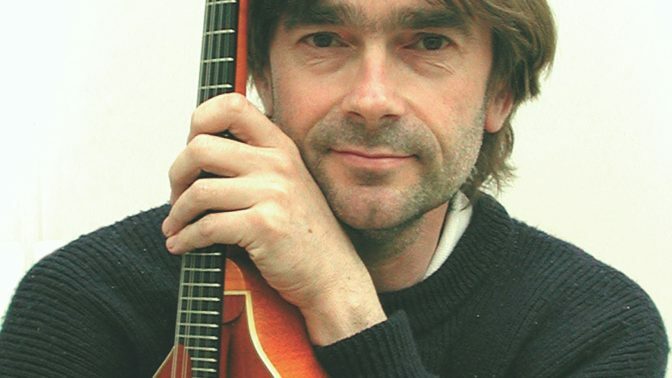 Simon Mayor is one of the world’s leading mandolin virtuosos and composers for the instruments. His many faceted career includes his own series on BBC Radio 2, an album in the Classic FM Top Ten chart and causing mayhem at a Canadian humour festival, but his most thrilling moment was a journey through the square window on BBC’s Playschool!